Menand, Louis. "Drive, He Wrote: What the Beats Were About." New Yorker 1 Oct. 2007. "A Brief Guide to the Beat Poets." Academy of American Poets . Empty Mirror . Magazine has good articles geared to the general reader on the Beats and their books. Reality Studio . On William Burroughs and the underground press in the 1960s. Articles by Jed Birmingham and the archive of small press materials are outstanding. The Beat Studies Association. Articles available here from the Journal of Beat Studies . Naropa Poetics Audio Archives. Audio files of lectures given at Naropa by Beat writers. The Naropa Archive Project is preserving and providing access to over 3500 recordings made at Naropa since 1974, which include lectures and readings by William Burroughs, Allen Ginsberg, Anne Waldman, Diane di Prima, Ann Charters, Michael McClure, Philip Whalen, and many others. Also Ginsberg's 31-session "Basic Class in Poetics." Internet Archive . Pull My Daisy, 1959. 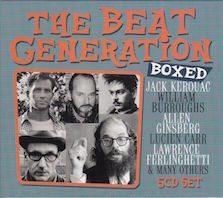 Narrated by Jack Kerouac, starring Allen Ginsberg, Gregory Corso, Larry Rivers. Presented by Robert Frank and Alfred Leslie, music by David Amram. The classic Beat film. At YouTube, the complete 26 minute version. Allen Ginsberg reads "Howl," YouTube. Candid photos of Allen Ginsberg, Philip Whalen, Neal Cassady, Gregory Corso, Michael McClure, and Bob Dylan, by Larry Keenan. Gerson, Mark. "Norman's Conquest: A Commentary on the Podhoretz Legacy. Discusses Norman Podhoretz and his 1958 Partisan Review article, "The Know-Nothing Bohemians." The Hoover Institution , 1995. Also Prodigal Sons: The New York Intellectuals and Their World , by Alexander Bloom. The Allen Ginsberg Project Includes photos from the 1940s to the 1990s, of Carl Solomon, Lucien Carr, Joan Vollmer, Herbert Huncke, Peter Orlovsky, Kerouac, Ginsberg, Burroughs, Neal Cassady, many others, and of his travels in California, Mexico, Morrocco, India and Japan. Gates, David. "Breaking up with the Beats." Salon Magazine . Novelist David Gates on the influence of the Beats on younger writers. [Ad-heavy]. Weddle, Jeff. Publisher's site for Bohemian New Orleans: The Story of the Outsider and Loujon Press (UP of Mississippi). William S. Burroughs reads "Is Everybody In?" by Jim Morrison, over music by The Doors (and mutters about Rimbaud and says, "Jim Morrison, drowned in a bathtub in Paris, seems a goddamned odd thing to happen to me") [won't load]. Excerpts from the 1968 interview of Jack Kerouac on "Firing Line" by William F. Buckley: "Ah, the topic tonight is the hippies, an understanding of whom we must, I guess, acquire or die painfully." Clay, Steve and Rodney Phillips. Excerpt from A Secret Location on the Lower East Side: Adventures in Writing, 1960-1980 . Based on the acclaimed 1998 exhibition at The NY Public Library documenting experimental literary publishing in this period (removed).